(May 13, 2013) – BuySoundtrax Records is proud to announce the release of Music From the Films of Ridley Scott, available digitally on May 14th and, in stores and from www.buysoundtrax.com on May 27, 2013. The recording was produced and arranged by Dominik Hauser, performed by the American Film Symphony, and features performances by Brandon K. Verrett and Edgar Rothermich. Ridley Scott has produced some of the most critically acclaimed, commercial successes, and beloved films of the past 35 years. From his 1979 breakthrough, Alien, to the cult classic Blade Runner, to his three Academy Award nominations (Thelma and Louise, Gladiator, Black Hawk Down), Scott’s films have run the gamut, set in the past, present and future. One thing is constant in the works of Ridley Scott – he has worked with some of the best-loved composers of his time, including Jerry Goldsmith, Hans Zimmer, Vangelis, Trevor Jones, and more recently Harry Gregson-Williams and Marc Streitenfeld. 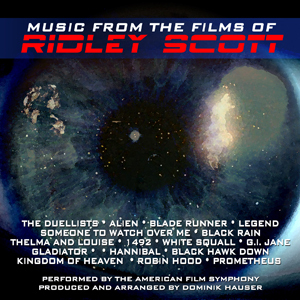 Music From the Films of Ridley Scott features tracks from Scott’s films including The Duellists (Howard Blake), Alien (Jerry Goldsmith), Blade Runner (Vangelis), Legend (Jerry Goldsmith and Tangerine Dream), Someone To Watch Over Me (George and Ira Gershwin), Black Rain (Hans Zimmer), Thelma and Louise (Hans Zimmer), 1492: Conquest of Paradise (Vangelis), White Squall (Jeff Rona), G.I. Jane (Trevor Jones), Gladiator (Hans Zimmer), Hannibal (Hans Zimmer), Black Hawk Down(Hans Zimmer), Kingdom of Heaven (Harry Gregson-Williams), Robin Hood (Marc Streitenfeld), Prometheus (Marc Streitenfeld). Goldsmith's Alien music is perfectly creepy. A nice collection.